In Search of . . . Inca Treasure, a captivating 22-minute look at Incan art, culture, and legend, narrated by Leonard Nimoy and first broadcast August 1, 1977. 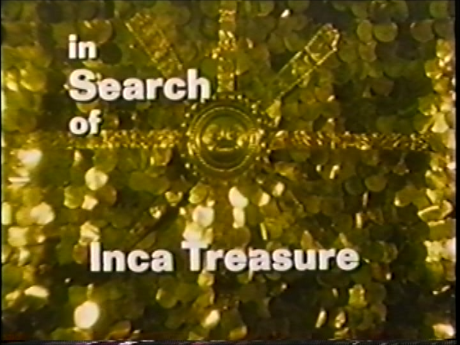 While In Search of… is usually noted for its exploration of pseudo-scientific legends and myths such as Atlantis, the Bermuda Triangle, Bigfoot, ghosts, and UFOs, it also produced a number of reasonably well-researched scholarly documentaries on such topics as the Aztecs, the historical Dracula, Vincent Van Gogh, Africanized “killer” bees, and, in this episode, the Incas. The "treasure" here is not gold, but rather the relics of a lost civilization. This episode surveys Incan history intermixed with tales of the discovery of Machu Picchu and related lore. An extended segment features a 1976 archeological expedition led by Professor Edmundo Guillén of San Marcos University in Lima, Peru, which rediscovered the lost city of Vilcambama, the fabled last refuge of the Incas against the invading Spanish. The ISO camera crew goes on location to follow Guillén and his colleagues into the interior. Considering the heavy equipment sensitive to the extremities of weather, filming in a tropical jungle must have taxed both scholars and technicians; however, the results bring an authenticity to the documentary.